What an adorable event! 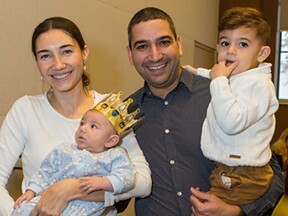 Jewish Federation of Winnipeg welcomed 29 new babies into the community on November 22 at the Shalom Baby Shower. New parents learned about the many programs and activities offered for young families and made new friends! Each family received a beautiful gift basket and babies were crowned as the new kings and queens of the community! Next Shalom Baby Shower: June 2019. To sign up, email fkatz@jewishwinnipeg.org.